Getting sick of looking at your old carpeting? Schedule a free carpet installation estimate with The Carpet Guys and renovate your floors today! 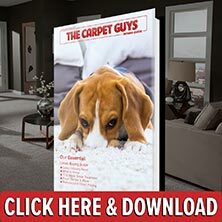 With The Carpet Guys, getting new carpet installed is quick and easy, and we guarantee you will love your new flooring. We are so sure that you will love the work we provide, that a free lifetime installation warranty will be provided with your job. Schedule an appointment and enjoy The Carpet Guys experience today. Plush Carpet – Looking to add some class and luxury to your home? Plush carpet will do the trick. With a rich velvet like look and feel, it is sure to bring out the sophisticated side of your home. Frieze Carpet – Want to give your home an informal and casual look? Frieze will give it that personality. The tightly wound fibers and unique designs are sure to give your rooms that off-the-cuff flair. Berber Carpet – Need some carpeting that can fend off a lot of beatings and foot traffic? Berber will give you that durability you need. This tight looped carpeting comes in cozy earth tones and fits well in any room you choose. Looped Carpet – Want to wow your visitors with a carpet that is fun and interesting? The multi-leveled looped carpet is the style to do it. Looped carpet can be found in many sought-after colors and styles. Whatever carpeting you are looking for, we have you and your floors covered. Schedule a free estimate with The Carpet Guys to get started today.